vacancies are started from 27-07-2017 and closing date is 12-08-2017. Apply online through CGVYAPAM official website of www.Cgvyapam.choice.gov.in. Selection for this CGVYAPAM Vyakhyata Jobs Recruitment will be held through written examination only and exam will be conducted on 27-08-2017. Only online applications are accepted for this Vyakhyata jobs recruitment of CGVYAPAM. 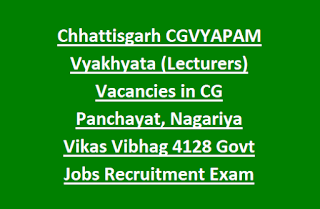 For more details regarding CGPEB Exam of Vyakhyata jobs in Chhattisgarh state CG Panchayat/Nagariya & Gramin Vikas Vibhag Exam Pattern, educational qualifications, Exam Syllabus, procedure of application submission online and more info is given below. For applying this CG Vyakhyata Jobs of CG Panchayat/Nagariya candidate must have qualified Bachelors Degree or Post Graduation in respective subject and should have qualified B.Ed or its equivalent. Age limits as on 01-01-2017 for Vyakhyata jobs is 21-35 years. Age relaxations are applicable for CGVYAPAM Vyakhyata Jobs as per CG Govt Norms. Candidates will be selected for this Lecturers jobs based on their performance in written exam only. Interested and eligible candidates can apply online for this CG Panchayat and CG Nagariya Vyakhyata Jobs through online on or before 12-08-2017. Candidates can selected either PRL 2017 or NNL 2017 and then apply for those vacancies. Submit application form online through official website of CGPEB @http://cgvyapam.choice.gov.in. Before applying read the official notification. 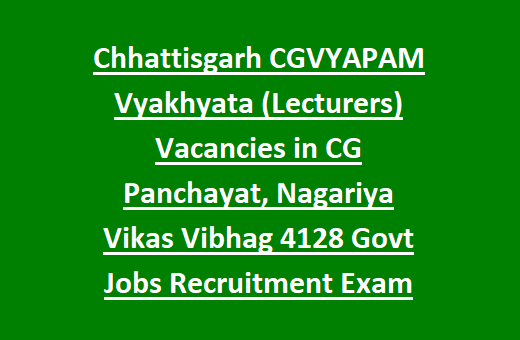 Apply Online here for the CHHATTISGARH CGVYAPAM Vyakhyata/Lecture Jobs Vacancy Recruitment 2017.